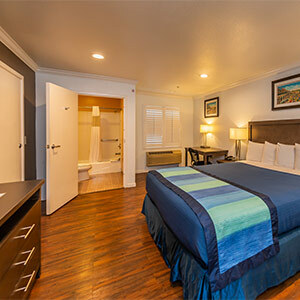 The Continental Inn sits conveniently on Ocean Street within walking distance to the Santa Cruz Downtown. 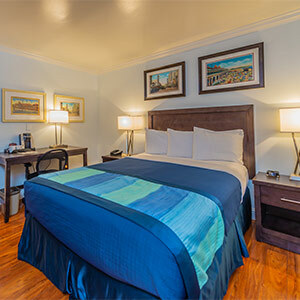 Our ideal location is 53-minutes from the Monterey Regional Airport, approximately 43-minutes from the San Jose International Airport, and just over one hour from the San Francisco International, and Oakland International Airports. 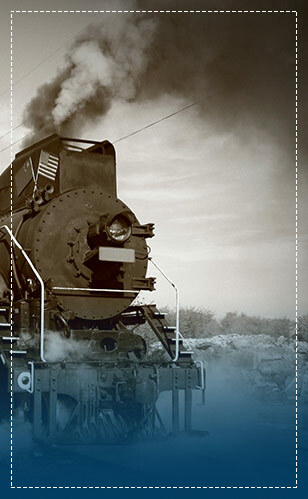 Our hotel offers easy access to Cabrillo Highway 1 and main thoroughfares for convenient sightseeing. 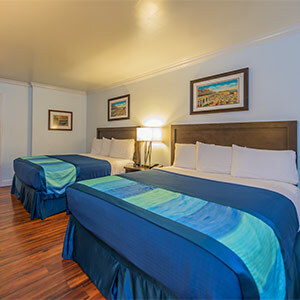 At the Continental Inn, guests are a short drive from the Santa Cruz Beach Boardwalk, Wharf, iconic attractions, restaurants, museums, and landmarks making us an ideal choice for leisure and business travelers. We look forward to hosting you on your next visit to Santa Cruz, California. At the Continental Inn, our focus is on guest satisfaction. We are pleased to provide special touches and services to ensure a comfortable stay like complimentary WiFi to keep guests connected to friends, family and colleagues, and complimentary self-parking. For an afternoon of fun or the perfect end to a busy day of sightseeing we offer a seasonally heated outdoor pool and hot tub. Vending machines with beverages are on-site. We are proud to be a 100% smoke-free property, that is pet-friendly. Additional amenities include a 24-hour front desk, multilingual staff, and copy services. 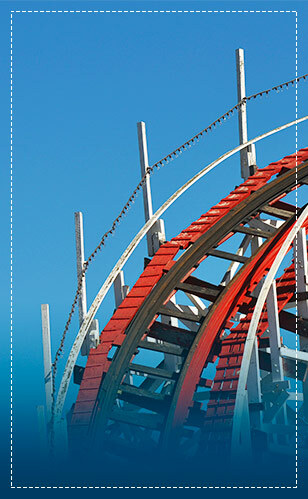 Santa Cruz, California is home stunning landscapes, miles of pristine coastline, and many family-friendly attractions. 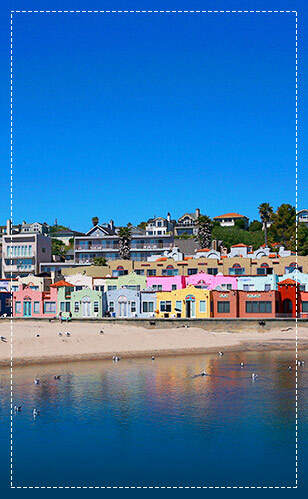 The famous Santa Cruz Beach Boardwalk promises a full day of thrills, and the Wharf is an ideal spot to go fishing, visit boutique shops, dine, or just people watch. Whether guests want to explore museums, enjoy a guided tour, catch a live show, or spend a quiet day in our seasonally heated outdoor pool and spa, Santa Cruz is a perfect destination to let go and relax. Our standard queen room can comfortably accommodate up to two guests and includes comfortable bedding, complimentary WiFi, personal climate control, a refrigerator and microwave, an iron and ironing board, a flat-screen TV with premium cable channels, Cubietime - an alarm clock with 2 USB ports and 2 outlets charging station, a Keurig coffee machine. 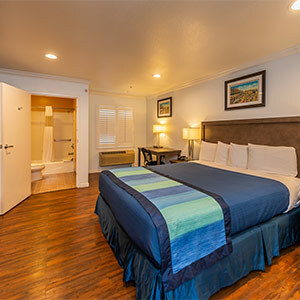 Our standard king room comfortably accommodates up to two guests. This well-appointed room includes comfortable bedding, complimentary WiFi, personal climate control, a refrigerator and microwave, an iron and ironing board, flat-screen TV with premium cable channels, Cubietime - an alarm clock with 2 USB ports and 2 outlets charging station, and a Keurig coffee machine. 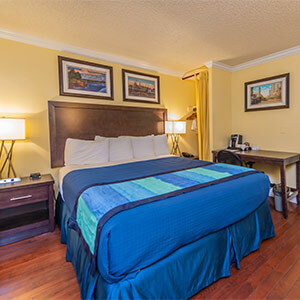 This spacious room is ideal for up to four guests and includes comfortable bedding, complimentary WiFi, personal climate control, a refrigerator and microwave, an iron and ironing board, flat-screen TV with premium cable channels, Cubietime - an alarm clock with 2 USB ports and 2 outlets charging station, and a Keurig coffee machine. Our Annex King is perfect for a couple or a single traveler looking for a large king size bed. This room type comes with a Keurig Coffee Maker, air conditioner, heating, microwave, refrigerator, and more. 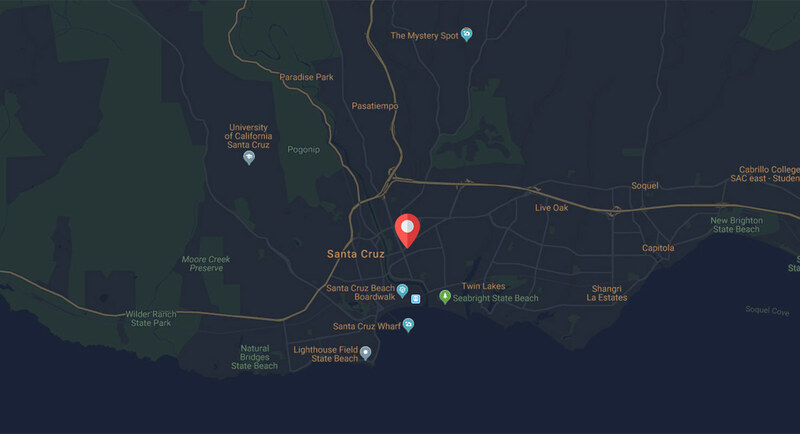 Santa Cruz is home to a variety of restaurants and dining options. Experience Santa Cruz's best seafood at one of the many restaurants along the wharf or enjoy your favorite meal at one of the top grills and cafes. Those in need of fine wine or specialty beer can explore the many wineries and breweries Santa Cruz has to offer. Come enjoy the variety of foods from around the world while you stay at the Continental Inn.